IMG Worlds of Adventure is presenting a spectacular Mardi Gras party with an entertaining carnival theme on 28th February 2019, offering all guest a special ticket price of AED 98. The night is lined up with great live musical performances, contortionist, saxophonist and drummers till midnight. DJ Abhijeet & DJ Saif from Channel 4, will set the mood throughout the night playing some of the top commercial music. The opening dance choreographed with special effects, contortionist, and stilts performance around so the guests can experience a sensational carnival opening. A Mardi Gras carnival wouldn’t be complete without a traditional street parade which will move across the IMG Boulevard. To bring the New Orleans Party atmospheres, the parade will include jugglers, stilt walkers, dancers, acrobats, unicycle tricks, Dixie band and other costumed characters with fusion of Venetian and European touch to entertain and engage guests of all ages. Additionally, to escalate carnival ambience, the IMG staffs will be wearing festival masks and feather boas. 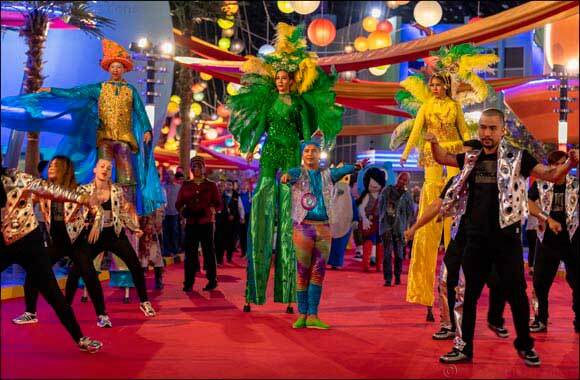 To get guests in the celebratory mood, the entire park will be decorated with colourful streamers, one of world’s largest indoor theme park will be transformed into an incredible colourful, feathery, with special assembled lining the street, trees & poles with material dazzling beads, feathers and balloons. Finally, for the guests that have worked up an appetite, an incredible list food available at IMG Worlds of Adventure’s 28 F&B outlets, making the festival the perfect excuse to get together with family and friends for an unforgettable family get together! In addition, guests looking forward to be a part of this event can enjoy all major rides and attractions. The event will begin from 7 pm to 12 midnight. The tickets can be purchased onsite and online, available on www.IMGworlds.com. The guests buying full price ticket on the same day, can joined the party for free after 7 pm.